Langshan Mountain is one of China's National Geological Parks famous for its unique Danxia landform and literally means "Crimson Glow." It is a rare topographic feature in world geography. Huge rocks of dark red color with grotesque shapes give tourists a marvelous sight. 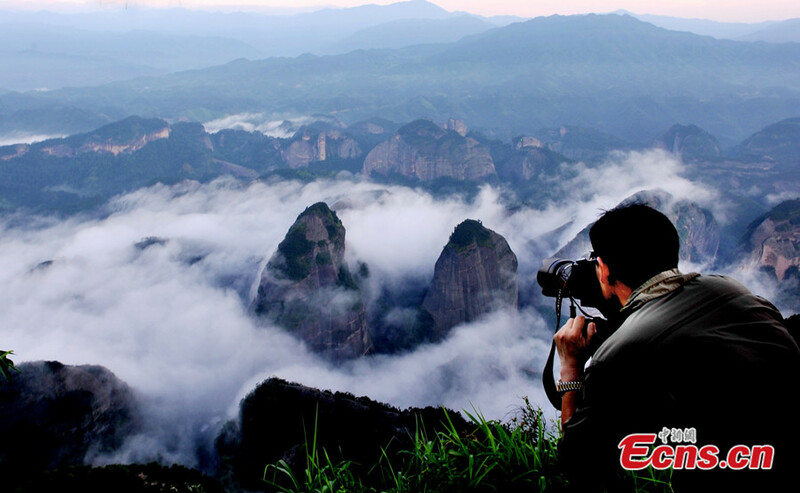 It is located in Xinning County, about 500 km away from Changsha, capital of Hunan province. In the south, Langshan Mountain is connected with Guilin, and in the north it echoes Zhangjiajie. Covering an area of 108 square kilometers, Langshan Mountain is filled with a rich natural scenery and abundant tourism resources. There are more than 500 scenic spots in Langshan Mountain. Among which the most famous are Tianyi Lane, Chili Peak, Zixia Cave, Fuyi River, Innate Bridge, Octagonal Castle, Emperor Xun Forest Park and the Xicun Ancient Dwelling. In 2008, Langshan Mountain was nominated as a World Nature Heritage. In august, 2009, some experts from the World Nature Heritage visited the site for inspection, and the mountain is expected to become a World Nature Heritage site next July. 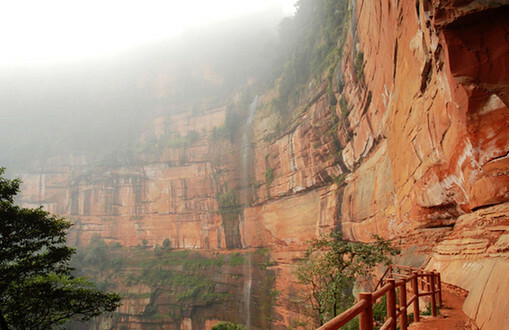 If this happens, it will be the second World Nature Heritage in Hunan after Wulingyuan in Zhangjiajie. The name of Langshan comes from an ancient legend. It is said that when Shun, a legendary monarch in ancient China, passed by the mountain, he felt the mountains and rivers here were so wonderful, so he entitled the mountain with a Chinese character - Lang, meaning "good mountains." Langshan Danxia landform and the evolution of its climate and features are representatives of Earth's historical evolution in Southeast Asia since the Cretaceous, and also represents the crust evolution process and the ancient environmental change of southeast China over 100 million years. It is considered to be an excellent example of the main stage of geo-evolution history. The Danxia landform refers to various landscapes found in southeast, southwest and northwest China that "consist of a red bed characterized by steep cliffs."